DON HENRY won the 1991 Grammy for Best Country Song with KATHY MATTEA's megahit, Where've You Been, and was the first Grammy Award Country song to add the Awards of The Academy of Country Music, the Country Music Association, and the Nashville Songwriter's Association International. Don Henry is the son of the renowned Bay Area musician, Hoyet Henry. Don Henry is a brilliant performer, an entertainer of wit and wisdom, a songwriter of amazing variety and clairvoyance. 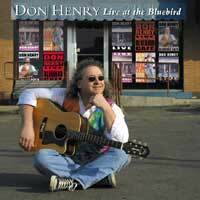 His fans who praised and treasured Don Henry's Sony album, WILD IN THE BACK YARD, were awaiting DON HENRY Live At The Bluebird. DON HENRY performs Live At The Bluebird with GARY NICHOLSON, BILL LLOYD, CRAIG COROTHERS, KIM RICHEY, TONY ARATA, VINCE MELEMED, KEVIN WELCH, ASHLEY CLEVELAND, JIM PHOTOGLO, DANNY FLOWERS, GENE NELSON, BYRON HOUSE, MOLLY FELDER, DAVE JACQUES and ERIC DARKEN. They add their brilliance and talent to an extraordinary album, recorded at various performances with DON HENRY Live At The Bluebird Café.